IoT sensors and devices live in the real world, often at far-flung locations. They need to communicate with home base, yet that communication comes with costs. Mobile data plans have come down tremendously in cost, but they still aren’t free. Each byte sent adds to that outlay. Wireless data transmission consumes battery power. The more a device communicates, the larger a battery it requires and the more frequently that battery must be changed. Spending for data, parts and labor will impact our IoT project’s return on investment. Luckily, by reducing the amount of communication in our system, the entire project can become cost-effective. Edge computing can save money by decreasing the frequency and amount of needless communication, while prioritizing the critical data required to make business decisions. “Edge” refers to the edges of a network — where your IoT devices are located. The edge is distinct from the server or cloud application that typically serves as the brains of the IoT system, but is far away from the devices themselves. By shifting a bit of that computing brainpower close to the devices, local logic can determine if a given event is worth the cost of communicating about it. For example, a liquid level sensor in a storage tank might take a reading every second, but most of these readings will be exactly the same. Without edge computing, we must to send every reading to a cloud application to determine if it matters, including repeats of the same number. This wastes bandwidth, battery, labor and money. A far better solution would be to have the device determine locally that a number was meaningful before sending it. That’s edge computing. It uses simple, low-cost local computing right on the device to make smart decisions. Now our level sensor can stifle repetitive transmissions and prioritize critical alerts. System costs decline while overall quality improves. And this is only one of edge computing’s many capabilities. There are several methods for managing bandwidth at the edge. Most systems implement a minimum rate of “heartbeat” transmissions that confirm device health and connectivity. Then filtering algorithms can prioritize the most important data for immediate transmission. Duplicate data that’s of no interest can be suppressed right at the source, saving on transmission, battery and cloud storage. Data can be also be aggregated locally so that useful summaries can replace torrents of unprocessed numbers. The full data set can be retained locally to support special investigations or debugging, with edge intelligence managing the local storage so it doesn’t run out of room. A truck will travel from Galveston TX to Cincinnati OH with a load of fresh fish, ideally stored at 40ºF. We need to log its internal temperature regularly to prove food safety and contract compliance. If the load gets too hot or too cold, an alert needs to go out immediately, and we want to start logging temperatures more frequently to get higher resolution data of the event. We want to save bandwidth and battery by sending only the data we need, given the current situation. For our examples, we’ll use a set point of 72º with a safe range of 65º-80º to simplify testing during development. Each of these examples delivers its data as text messages for fast, simple feedback. In production you can easily switch to the Digi Remote Manager® version of the same code, provided for each example. The DRM version will post to an online data stream that can be viewed through the DRM interface or accessed externally using an API. See our previous post for more information on Digi Remote Manager, or visit the Digi Remote Manager site page. Reducing communications reduces bandwidth use and can save us money. However we need to hear from our devices every once in a while, so that we know they’re still alive, and to log a minimum amount of data. This is typically accomplished by sending regular “heartbeat” or status messages, even when no other events have triggered a transmission. For example a flood sensor would only send alerts when it detects water. But we’d also want to confirm it is alive and working on a daily basis. Even when there’s no water detected, it could send a heartbeat message once per day, confirming that it’s still alive and dry. To begin, let’s set up this heartbeat message. This will establish the minimum amount of contact your IoT device will make. We will build on this code throughout the following examples. Each addition demonstrates strategies for reducing unnecessary bandwidth use without impacting the overall application. Getting Started: Demonstrates how to set up the hardware and software you’ll need. Hello World Example: Teaches how to upload code to Digi XBee3. 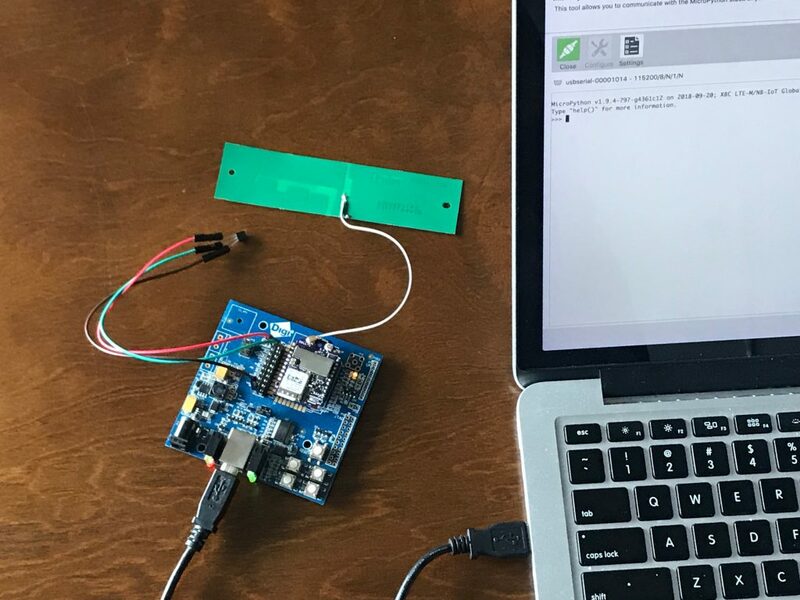 Sense, Transform and Send a Value: Shows how to take a temperature reading and send it as a text message. This heartbeat example code is similar to our original temperature sensing code in the first post in this series. There are two functional changes; it runs continuously now, and that the wait_time is extended so that messages only arrive every 15 minutes. Structural changes were also made, organizing the code into functions to make it more modular and readable as we build it out further. These don’t change the behavior, they just make it easier for us humans to understand what’s happening. Copy the below code to a text editor like Notepad. Be sure to enter your own phone number, replacing “your_mobile_number_here” before uploading the code. Enter it just as you would dial it on a cell phone, including the + symbol if needed. By default, this program sends a temperature reading every hour. You can customize that by changing the wait_time variable as desired. Remember, this sample code must be edited before you upload it. # ENTER YOUR PHONE NUMBER, REPLACING "your_mobile_number_here" BEFORE UPLOADING THIS CODE! Press Ctrl+F at the >>> prompt to put MicroPython into Flash Compile mode. Copy the script from your text editor and paste it into the MicroPython Terminal. Press Ctrl+D to finish and answer N when you’re asked. Finally press Ctrl+R to run your code. You can stop execution by pressing Ctrl-C.
To run the same example, posting to Digi Remote Manager, use the following code. # ENTER YOUR DRM username and password, REPLACING "your_username_here" etc. BEFORE UPLOADING THIS CODE! username = 'your_username_here' #enter your username! password = 'your_password_here' #enter your password! The heartbeat program quieted down our data use and saved us some bandwidth. However it risks missing important events that happen between updates. Edge computing will help solve that problem. For example, let’s say that our goal is to keep temperature within a certain range, maybe between 65 and 80 degrees F. As long as the temperature is within that range, the heartbeat data maintains a historical record and confirms that the sensor is online and functioning. During events of interest, however, we want much faster sampling to create high-resolution data of everything that happened during the event. By defining a range, we eliminate spending on low-value data, while prioritizing high-value event data. This increases our return on investment for the entire system. Range filtering is easy to do. Every time we read a temperature, we check if it’s outside of the defined range. If it is, we send that data right away. If the temperature is within the safe range, we only send one “heartbeat” reading every 15 minutes. This gives us lots of data when it matters and only a trickle when things are fine. We are already starting to use bandwidth more intelligently. Copy the below code to a text editor like Notepad. Be sure to enter your own phone number, replacing “your_mobile_number_here” before uploading the code. You can also change the wait_time, heartbeat_wait, min_temp and max_temp variables, if desired. Once the code has been edited by adding your mobile phone number, it can be uploaded in XCTU at the MicroPython Terminal in the usual way: Ctrl+F, paste, Ctrl+D, then Ctrl+R to run your code. Filtering saved us a lot of bandwidth between interesting events. However you may have noticed that during events, when the temperature is outside of the defined safe range, we’re sending a lot of duplicate readings. If the temperature stabilizes at 85 degrees F, our device will spend its battery and our money pointlessly sending the same value over and over again. Certainly not what we want. We can use a lot less bandwidth by eliminating these duplicates. In fact, we can suppress not only exact duplicates, but also any unimportant minor changes. Remember that our “heartbeat” data will still come through, confirming our device is fully operational. The code below sends heartbeat data every 15 minutes by default. It also checks the temperature every 10 seconds, but only sends additional data when readings are outside of the safe range AND when they differ from the last data point sent by at least 2 degrees. You can change those defaults by changing the values at the beginning of the code. Copy the below code to a text editor like Notepad. Be sure to enter your own phone number, replacing “your_mobile_number_here” before uploading the code. These examples show a few powerful ways to improve your IoT system’s bandwidth and battery use. We created a minimum “heartbeat” of data that’s sent relatively infrequently to reduce bandwidth costs. Then we defined a “safe” range and added some code to send data immediately and frequently during important high and low temperature events. Finally, we removed redundant duplicate data and minor changes that are not of interest. The results are a system that sends minimal data when things are fine, and immediately transmits just the urgent data that matters. That drastically reduces our data costs as well as our storage costs. When combined with low-power sleep modes, it will also greatly improve battery life. Look for power management examples in future posts. Filtering and de-duplication are examples of the many useful bandwidth reduction strategies. Upcoming examples will demonstrate how to aggregate and analyze data prior to transmission, further improving your ROI. >>> LEARN MORE ABOUT THE DIGI XBEE ECOSYSTEM OF WIRELESS MODULES, OR CONTACT US TO DISCUSS YOUR NEEDS.